Make your kids a pancake portrait (or caricature) with a little help from scrambled eggs and their favorite fruits. Voilà, an edible masterpiece! Tip: If the kids don't like eggs, try shredded hash browns for hair. No hearty effort needed at the griddle to show them how much you love them. Pour some batter into a squeeze bottle, then trace a heart shape on the griddle and fill it in quickly. They'll flip for these flapjacks. Add cake-pop sticks to silver-dollar-sized pancakes as they're bubbling on the griddle. Then, sprinkle with powdered sugar for a mess-free, sweet start to their morning. To "soft serve" this yummy treat, just slice a banana and arrange the slices over a fourth of a waffle. Super simple—and no ice-cream headache. Fill up these pancake taco shells with your kids' favorite fruits, chopped into bite-size pieces. Sweeten the meal deal with a spoonful of whipped cream. Brighten the kids' morning with a sunny arrangement of orange slices, pineapple and strawberries. It's a perfect way to add sunshine to a rainy day. A new take on the "toad in the hole" breakfast: Cut a heart shape from a piece of toast with a cookie cutter. Then, place the toast in a hot pan and crack an egg into its center. Cook for a few minutes until the egg is done. Start with a tasty muffin to make the snail's shell. Then add a peeled banana for his body. Use sprinkles, gel frosting or dabs of jelly to add a little smiling face. 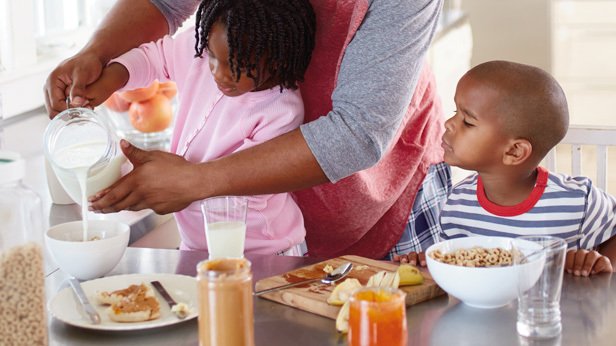 Kids won't mind slowing down for this breakfast! Spread peanut butter into a heart shape onto a piece of toast for the bear's face. Use banana slices for ears and raisins or dried cherries for his eyes and nose. Drizzle honey over all (because that's what bears love best). Then give your kid a big bear hug on the side. Say "I love you" with these easy heart-shaped toast cutouts. Use a cookie cutter on toasted bread to create these sweet hearts, and then serve them up with some cinnamon butter, peanut butter or their favorite jelly. Jeanne Field is a Hallmark editor who loves finding ways for her kids to get as messy crafting as she does.